Home / Phcog J, Vol 9, Issue 6, Nov-Dec, 2017 / Characterization and Distribution of Flavonoids from Flowers in Different Horticultural Types of Begonia. 1Department of Medicine, Faculty of Medicine, University Ferhat Abbas, Sétif, ALGERIA. 2Laboratory of Phytochemistry, University Claude Bernard-Lyon I, Villeurbanne, FRANCE. 3University Frères Mentouri Constantine 1, Constantine, ALGERIA. Background: The begonias are ornamental plants known by the varied forms and colors of their flowers, as well as their decorative foliage. 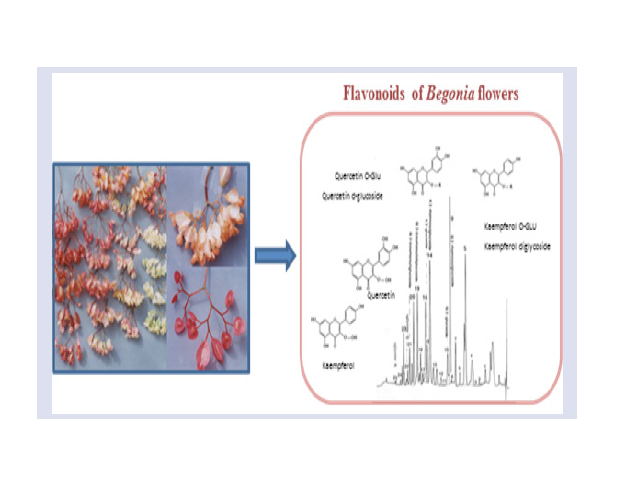 Objective: This study attempts to characterize the flavonoids isolated from flower extracts of different horticultural cultivars of the genus Begonia. Material and methods: The compounds of the ethyl acetate and aqueous extracts were separated by chromatographic methods and identified by UV spectra and chemical techniques. Results: The analysis allowed the characterization of flavonoids belonging to flavonol types in the free aglycones and glycoside forms of kaempferol and quercetin. On the other hand, fingerprinting analysis and quantification of major flavonoids of 184 cultivars were performed by high-performance liquid chromatography (HPLC). Among twenty five (25) components which were detected and separated: ten were corresponding to quercetin 3-Oglucosyl- rhamnoside (Rt=23.5), quercetin 3-O-glucoside (Rt=25), kaempferol 3-O-glucosylrhamnoside and its acylated derivative (Rt=32), kaempferol 3-O-glucoside (Rt=33), quercetin 3-O-p.coumaroyl-diglucoside (Rt=37), quercetin 3-O-P.coumaroyl-glucoside (Rt=40.5), quercetin (Rt=41.5), kaempferol and its acylated derivative (Rt=47). Only non-acylated glycosides of quercetin and kaempferol contributed to chemical variations among different cultivars based on the results of PCA. Conclusion: The genus Begonia is very heterogeneous and it is possible to distinguish several chemotypes whose differences rely on the complementarities between the metabolic pathways involved in the biosynthesis of glycosides of quercetin and kaempferol. Keywords:Begonia, Chemotype, Distribution, Flavonoids, HPLC. Karima S, Nadine C, Fadila B, Maurice J. Characterization and Distribution of Flavonoids from Flowers in Different Horticultural Types of Begonia. Pharmacognosy Journal. 2017;9(6):850-855.